While Illinois is celebrating its bicentennial this year, and the Pekin Area Chamber of Commerce will celebrate its quasquicentennial (125 years) next month, there are two other Pekin community organizations that have almost, but not quite, made it to their centennials: the Pekin Rotary and Pekin Kiwanis clubs. Enthusiasm for social clubs and service organizations apparently was very high in Pekin in 1920, only two years out of the First World War. Several social clubs then active in Pekin (such as the Tazewell Club) no longer exist, but the Pekin Rotary Club and the Pekin Kiwanis Club, which both were christened in the spring of 1920, are still going strong today. The Pekin Rotary Club – one of tens of thousands of clubs that belong to Rotary International – was organized in April 1920. The first Rotary Club was founded by Paul P. Harris and three of his friends in Chicago on Feb. 23, 1905, only 15 years before Rotary came to Pekin. The name “rotary” was chosen because the club’s meetings would rotate among the members’ business offices. Pekin’s Rotary Club was started by five businessmen: Harry Wilmot, Walton T. Conover, Frank Beyer, Carl E. Kraeger, and Louis C. Moschel. The club began with 25 charter members, and Moschel served as the club’s first president for four consecutive annual terms before he was succeeded by Carl G. Herget in 1924. For much of its early history, Pekin Rotary met weekly in the old Tazewell Hotel located at the corner of Fourth and Elizabeth streets near the courthouse. 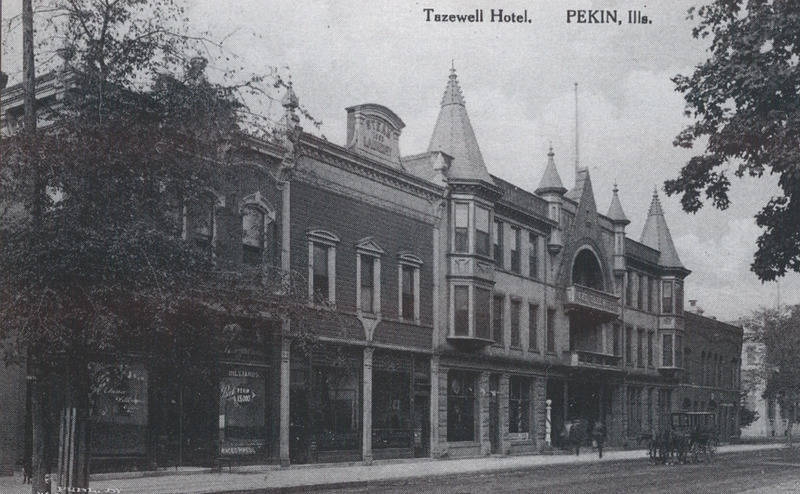 In its early years, the Pekin Rotary Club held its regular meetings in the old Tazewell Hotel on Elizabeth Street in downtown Pekin. With a motto of “Service Above Self,” the purpose of Rotary is to encourage business persons, professionals, and community leaders to be active in works of service and charity. Its service projects and programs over its history have included tree planting, fishing derbies, the Pekin Mobile Diner, scholarship awards, and the sponsoring and hosting of foreign exchange students. Pekin Kiwanis held its organizing meeting on May 24, 1920, and a story reporting that meeting appeared on page 8 of the following day’s Pekin Daily Times. “With over forty men present last night the Kiwanis Club of Pekin was formerly (sic – formally) organized in the circuit court room of the Tazewell court house,” the story said. W. S. Prettyman was elected temporary chairman for the organizing meeting. 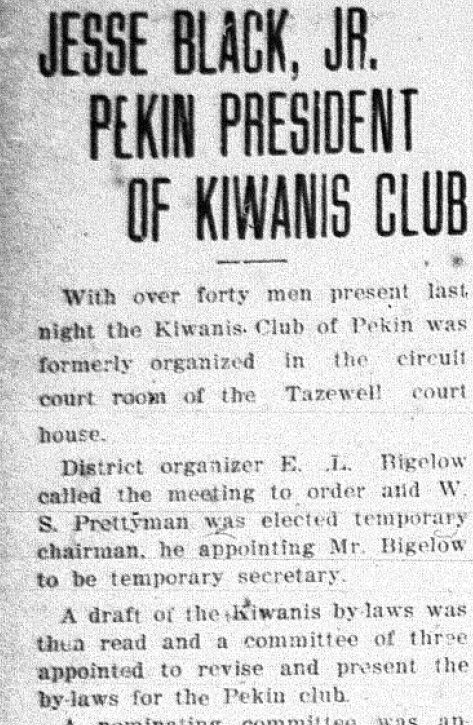 Shown here is a detail from the May 25, 1920 Pekin Daily Times story on the organizing meeting of the Pekin Kiwanis Club which had taken place the evening before. At the meeting, Dan Wentworth, lieut. governor of the Illinois and Eastern Iowa districts, explained the club’s purposes and aims, “declaring that the organization stood for the square deal, for service ‘to the other fellow,’ for the Golden Rule in business, and for the building up of the community, the state and the nation.” Kiwanis and Rotary thus have much the same purpose and aims. At the first meeting, the following officers were unanimously elected: Jesse Black Jr., president; J. C. Aydelott, vice president; Ben P. Schenck, treasurer; and seven directors, W. S. Prettyman, H. J. Rust, Nelson Weyrich, R. E. Rollins, Louis Albertsen, O. W. Noel, and J. T. Conaghan. The first regular meeting, where the club charter was presented, was then set for Wednesday evening, June 2, 1920, at the Pekin Country Club house (then located where Pekin Community High School is today), with plans made for weekly luncheon sessions. The long years of service to the community of Rotary and Kiwanis is memorialized by the Pekin Park District, which oversees Rotary Park at the former site of Garfield School and Kiwanis Park near L. E. Starke School.